Drug Education Kits help educate youth and adults about the dangers of alcohol and drugs to help change their perception or prevent them from using. With replica examples of drugs & paraphernalia, the kit is accompanied by a flash drive which contains information on the drugs and paraphernalia displayed. It also includes references, types of various drugs, signs and symptoms of abuse and a brief physical description of each drug. The kit demonstrates alcohol, major drugs such as opioids, inhalants, tobacco, marijuana, synthetics, club drugs and cocaine. We regularly update the kit, recently including Fentanyl examples. "These outstanding Drug Education Kits have been successfully utilized by federal, state and local law enforcement agencies to train and educate young and old alike in an effort to provide a greater awareness of the dangers of the drug culture. In addition, the sales of these up-to-date and life-like replicas are used to support the mission of Drug Prevention Resources, its coalitions and partnerships throughout Texas and the entire country, to help create a drug-free generation." Money raised from the sale of the Drug Education kits is used to further promote our organizations vision of a drug-free generation. For international orders, please call +1 972-518-1821 or email orders@drugfreegen.org. Kits cost $350 Each + $20 shipping/handling per piece--domestic only--and applicable sales tax of 8.25%. Do not add tax if your organization is Exempt. By submitting this form, you agree to payment terms with Drug Prevention Resources. On receipt of payment, allow 2 – 4 weeks for shipping. Drug Prevention Resources (DPR) offers drug education kits for purchase for the education in organizations, communities and for individuals. 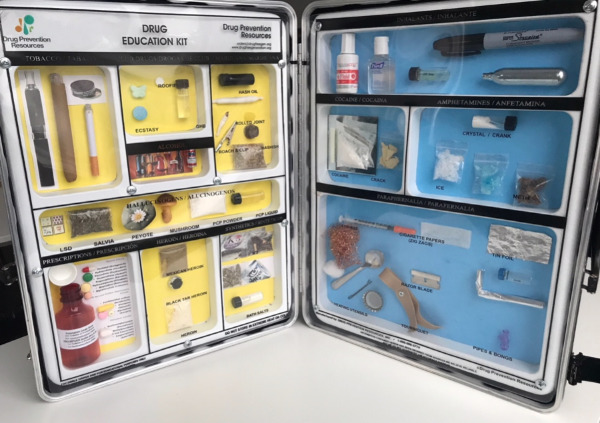 Drug Prevention Resources does not guarantee that each item within the kit represents the intended item exactly, rather it is an example of types and similar look/feel. Drug Education Kits are not warrantied against misuse including excessive wear or handling. Please keep kits out of extreme heat and cold. Items are intended to remain inside kit behind protective cover and not be to handled. For international orders the customer will be liable for all customs & duties fees.